'Om Mani Padme Hum' in Sanskrit or 'Om Mani Peme Hung' as in Tibetan Buddhism is known to contain the essence of all of Buddha's teachings in this magical six syllable mantra of the bodhisattva of compassion, Avalokiteshvara (Tibetan Chenrezig, Chinese Guanyin). The Jewel refers to the Mind or consciousness and the Lotus refers to the Heart that is the source of Love energy. which has reached the Heart's lotus." It is very good to recite the mantra OM MANI PADME HUM, but while you are doing it, you should be thinking on its meaning, for the meaning of the six syllables is great and vast. The first, OM, is composed of three pure letters, A, U, and M. These symbolize the practitioner's impure body, speech, and mind; they also symbolize the pure exalted body, speech and mind of a Buddha. The two syllables, PADME, meaning lotus, symbolize wisdom. Just as a lotus grows forth from mud but is not sullied by the faults of mud, so wisdom is capable of putting you in a situation of non-contradiction where as there would be contradiction if you did not have wisdom. There is wisdom realizing impermanence, wisdom realizing that persons are empty of self-sufficient or substantial existence, wisdom that realizes the emptiness of duality (that is to say, of difference of entity between subject and object), and wisdom that realizes the emptiness of inherent existence. Though there are may different types of wisdom, the main of all these is the wisdom realizing emptiness. Purity must be achieved by an indivisible unity of method and wisdom, symbolized by the final syllable, HUM, which indicates indivisibility. According to the sutra system, this indivisibility of method and wisdom refers to one consciousness in which there is a full form of both wisdom affected by method and method affected by wisdom. 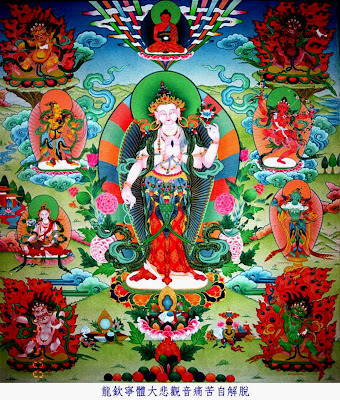 In the mantra, or tantra vehicle, it refers to one consciousness in which there is the full form of both wisdom and method as one undifferentiable entity. In terms of the seed syllables of the five conqueror Buddhas, HUM is the is the seed syllable of Akshobhya- the immovable, the unfluctuating, that which cannot be disturbed by anything. Thus the six syllables, OM MANI PADME HUM, mean that in dependence on the practice which is in indivisible union of method and wisdom, you can transform your impure body, speech and mind into the pure body, speech, and mind of a Buddha. It is said that you should not seek for Buddhahood outside of yourself; the substances for the achievement of Buddhahood are within. As Maitreya says in his SUBLIME CONTINUUM OF GREAT VEHICLE (UTTARA TANTRA) all beings naturally have the Buddha nature in their own continuum. We have within us the seed of purity, the essence of a One Gone Thus (TATHAGATAGARBHA), that is to be transformed and full developed into Buddhahood. Thanks for sharing your love.